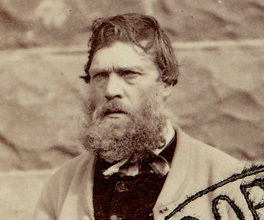 Harry Power was a notorious bushranger with links to Ned Kelly and the Kelly Gang. He had stints working with various other criminals, but for the most part, Power worked alone. Originally from Ireland, Power came to Victoria in 1848 shortly before gold was discovered. He was arrested for several crimes and was eventually given a 14-year sentence at Pentridge prison for stealing a horse, but managed a daring escape in a rubbish cart. Harry Power was a bushranger of great confidence and flair. He was known for the sense of humour with which he conducted his crimes, as well as the fact that he never killed any of his victims. On one occasion he was confronted by three armed young men who told him they were hunting the bushranger Power. He begged them for protection and pretended to go along with them. When the opportunity presented itself, he robbed them of their guns, clothes and boots, leaving them to find their way home through the bush completely naked. Jones, I 2003, Ned Kelly – a short life, Lothian Books, Melbourne, Vic. This quote was found in a secondary source even though it originally appeared in a newspaper. Secondary sources are a great short cut to compelling primary source quotes since the writer has already done the research for you. In the end, Power's undoing was a gold watch which he had stolen. He used a representative, Jack Lloyd, to let its owner know he could have the watch for payment of three times its value. The police became aware of the situation, and Lloyd led them directly to Power's hideout, where he was quickly overpowered. He was sentenced to another 14 years in Pentridge. On his release, Power worked as a gamekeeper, and then as a caretaker on the Success, a ship that had served as a prison hulk but had been turned into a travelling waxworks display of the torture and punishment dealt out to criminals. The ship sank but Harry survived and returned to the bush. In 1891 he died an old man with only a few shillings to his name.